OwNet lets you browse the Internet faster, share interesting websites, documents and view saved websites even without Internet connection. It consists of the following parts. The main application needs to be opened at all time to make use of the features of OwNet in your web browser. You can chat with people nearby and share files from this window. This window also gives you options to configure OwNet, you can find them in the menu Tools. When you browse the Internet and visit websites, OwNet automatically saves them and lets you view them even if you lose Internet connection. OwNet also enhances your browsing experience by giving you options to rate, recommend and tag websites. If the bar obstructs you to see the content of webpage, you can close it by clicking on the close button. The OwNet box opens when you click the “Show OwNet” link in the OwNet bar. 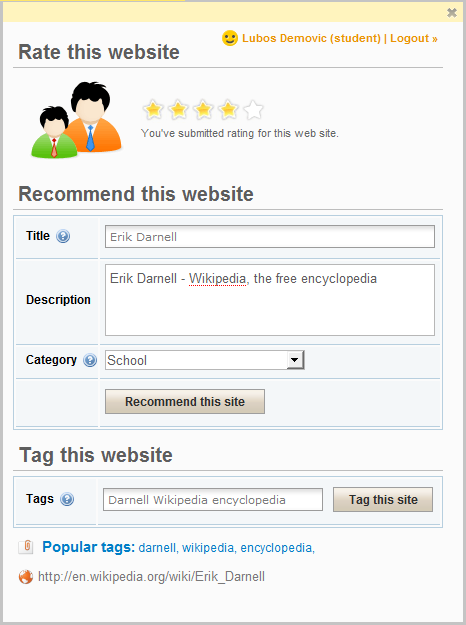 It gives you options to rate, recommend and tag the current page. The OwNet homepage is the central place where you can see all the activity in your OwNet. You can view ratings, recommendations and files shared by you and other people on your OwNet network. You can access the page by clicking the home button in the OwNet bar, or typing in the link: http://my.ownet/. This page also lets you register and log in, which is required for enjoying the whole OwNet experience. You can also search websites saved in OwNet even without connection to the Internet.